Sugar Bytes has released Wow, a new filter plug-in that features ten different filter types. Other feature highlights include a Vowel Mode, an Overdrive function and a versatile modulation system. Said to be pleasingly fat, Wow offers variations on all the standard filter types (high-pass, band-pass, low-pass etc). The Vowel Mode, meanwhile, is designed to treat everything you put through the plug-in with a 'talk-style' effect. Then there's that Overdrive processor, which is on hand to endow your signal with some beefy analogue warmth. Elsewhere, there are modulation options aplenty. Not only can the modulation signals for each parameter be mixed individually, but they can also modulate each other, expanding the creative potential of Wow considerably. 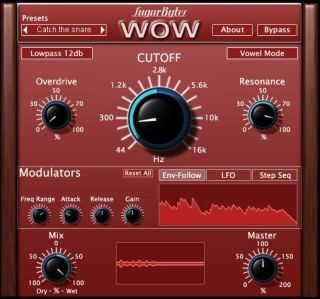 Wow supports the VST and AU plug-in formats and is available now for $99/€79 on Mac and PC. A demo version can be downloaded from the Sugar Bytes website.